Life in the Clouds: Someone Pinch me, Please! Since my last blog we have seen and done so much! Now that we have all been assigned to teach certain classes, and have been traveling and becoming comfortable with our housemates, time seems to be flying by! I have been assigned to the 7th and 8th grade classes along with fellow volunteer Christina. Our 7th grade class is very large with 44 students, and for the first few weeks they were a bit challenging. But now, Christina and I, or “The Dynamic Duo” seem to have a system down that works. Our 8th grade class is quite a bit smaller with a total of 11 kids, this makes one-on-one teaching easier, and makes for a teaching environment that is a little more personal. It is an incredible feeling to be able to teach all of these kids, and to walk away knowing that not only have you changed their lives, but they have more importantly, changed your own. When you see kids improve in class, and see their eyes light up when they know the correct answer--that's what this program is all about. Travel has been a big part of my time here, we have made trips to nearby town such as Xela, Pana, and others. A big trip for me was when we went to Tikal, which was probably one of the best trips that I have ever been on. 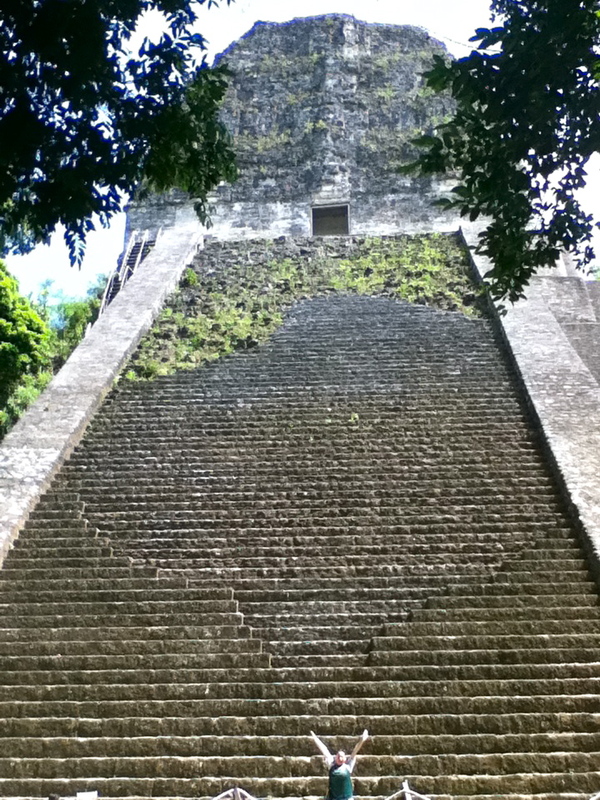 We saw beautiful Mayan ruins, hiked in the park, and had an absolute blast! We were able to watch the sunset and sunrise on top of the tallest temple and it was great to experience the animal kingdom prepare for sleep at sunset, then experience the awakening of the jungle at sunrise! Just this past weekend we traveled to San Pedro, where we stayed the night, ate delicious food and went to a small carnival where we rode a ferris wheel that was a little sketchy but fortunately, we all live to tell the tale! On Saturday we went kayaking, which was a big deal for me because I am terrified of water! But thanks to Dana and her support, not to mention her beautiful singing, I was able to face a fear and do something that I never thought I could. It was a very powerful feeling to know that I could, it was so great! This weekend we are going to travel to Antigua, where we will meet the new PDs that will be here for the next 13 months- so excited! After the PDs arrive on Saturday, all of us will be helping to train them and show them the ropes. Then we leave it in their hands to continue our programs. Another up-and-coming activity is mini-camp! We're going to have various activities perhaps including dance, sports, crafts, and English classes! What fun! I am really excited for this! It seems that my time here is rapidly coming to a close and I cannot believe that we only have two and a half weeks left! Someone pinch me! I plan on soaking up every last bit of awesomeness that these last two and a half weeks have to offer, and enjoying every last second!